ReclaiMe Pro is unique in that it combines the capabilities of RAID configuration recovery, both manual and automatic, and subsequent RAID data recovery. With ReclaiMe Pro you can recover RAID data from RAID1, RAID0, RAID10, RAID 5, RAID6, and RAID5E. Once you have the source devices, be it image files, disk clones, or RAID member disks, ReclaiMe Pro immediately tries to find and process the most well-known software RAID metadata such as md-raid, LVM, LDM, and Drobo1. If the metadata is not severely damaged, ReclaiMe Pro displays the found RAID partitions so that you can proceed with RAID data recovery. In case of severe damage, when ReclaiMe Pro fails to determine a RAID configuration at first view, the software provides opportunities to recover RAID configuration automatically or manually. 1 Note that parsing Drobo metadata is the only recovery option for Drobo units because of the complexity of the Drobo BeyondRAIDTM layout, that is neither automatic nor manual RAID recovery mode can be used for Drobo units. Unlike ReclaiMe Free RAID Recovery where there are no settings except RAID level, ReclaiMe Pro features a highly-configurable automatic RAID recovery with about ten configuration options such as minimum and maximum block size, scan direction, hotspare detection and removal, and so on. Having set all these RAID recovery parameters, data recovery technicians can speed up their RAID data recovery. 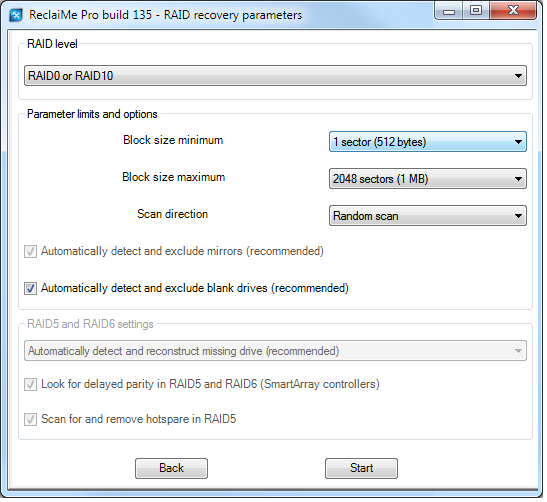 ReclaiMe Pro allows you to set RAID configuration parameters manually and then add the assembled RAID to the list of devices available for data recovery. For a configured RAID, ReclaiMe Pro graphically depicts the configuration you set up, thus helping you to avoid mistakes associated with different interpretations of various RAID terms such as synchronous/symmetric, left/inverted, and so on. Additionally, in ReclaiMe Pro there is a powerful RAID analysis tool aimed at helping to narrow the number of possible RAID configurations both for automatic and manual RAID recovery. More information about RAID analysis capability.